COSOOS Universal 6-Port USB Charging Station Dock and 7 USB cables/cords Leads to more convenience. Perfect for a family, hotels or company! Due to 2.4A charging port, it can charge your phone 50% faster than normal charging. Built-in intelligent chip provides identification on your devices and supply exact demanded current for fast charging. With 6-USB port charger station dock, it can fully charge up to 6 devices (including iWatch) simultaneously on your desktop. It is easy to use, ultra compact and space-saving. This compact electronics charging station keeps everything in one place, which efficiently eliminates clutters and tangled wires while charging and save much space. Detachable baffles fits all sizes of devices and protects your devices from accidentally falling off from this cell phone docking station. As long as is charged by USB power, it is compatible with this battery charger. 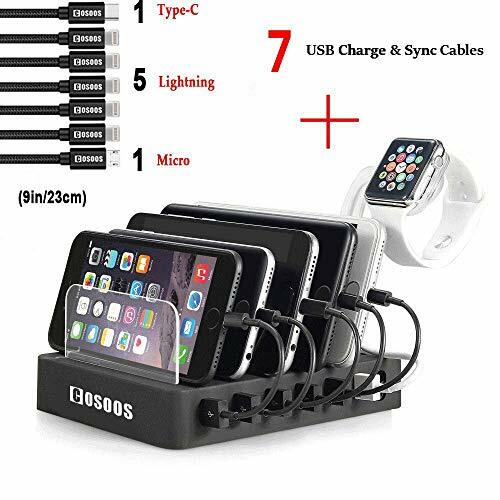 SAVE 3.49 BUYING COSOOS LIGHTNING/ MICRO/ TYPE-C CABLES(4 PACK), DOCKING STATION and PHONE CHARGER in 1- Mum,students,family,hotel, restaurant or company must-have,provides one-stop charging solution for multiple devices charging task. This compact charging station works smoothly with any USB-powered device such as iPhone, iPad, iWatch,iPod and Android smartphones, tablets, Kindle,smart speaker,earbuds,power bank,Qi wireless charging pad,headsets or COSOOS headlamp. 7 CABLES INCLUDED - Our COSOOS phones organizer comes with 7 short charge &sync cables(5 iPhone Lightning, 1 Micro-B, 1 Type C).DO not waste your money buying additional charging cords again. TIDY& ORGANIZED - No more cluttered cables. You do not have to plug a bunch of chargers on your power outlet for every phone and tablet you have. COSOOS electronics charging station keeps all devices in one place,nice and clean. INNOVATIVE REMOVABLE BAFFLE DESIGN - Detachable baffles and base can be effortlessly separated. Just choose which baffle be left then you have enough space to fiddle with the posture of your devices, lying flat or sideways to charge. It can save a lot of space and is easy to carry on the go. Include 7 baffles,1 watch holder,7 short usb charging cables. If you have any questions about this product by COSOOS, contact us by completing and submitting the form below. If you are looking for a specif part number, please include it with your message.